Dental Implants are one of the most researched materials in Dentistry. A Dental Implant is cylindrical and made of titanium. The most common procedure involves placing the implant in the jaw where it becomes integrated with the bone. Dental Implants are one of the most researched materials in Dentistry. A Dental Implant is cylindrical and made of titanium. The most common procedure involves placing the implant in the jaw where it becomes integrated with the bone. 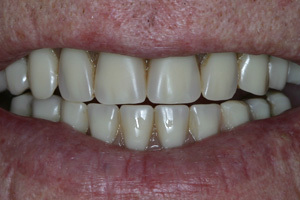 After a healing period to allow for complete integration, the implant is uncovered and a restoration is placed on it. You’ve no doubt read or heard about restoring implants the same day they are placed. These so called “teeth in a day” are being highly advertised. While this procedure can be effective, the patient needs to appreciate that there is an increased risk of failure associated with immediately loading an implant. 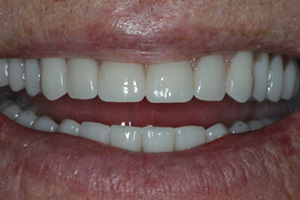 Dental implants can support a fixed or removable prosthesis. Extremely versatile, they can be used to replace a single missing tooth or a full arch of teeth. Dr. Hill has been restoring Dental Implants for over twenty years and is a Fellow in the International Congress of Oral Implantologists, and a member of the American College of Oral Implantology. Dr. Chumbley has received surgical training for dental implant placement. Dental Implants are a great option to replace one or many missing teeth. Once the dental implant has integrated (4-6 months), Dr. Chumbley and Dr. Hill can provide a beautiful custom and long-lasting restoration. Existing denture patients can also benefit greatly from dental implants which help stabilize the denture and allow the patient better function and quality of life.